We’ve been raising chickens since 2015, when we started with one coop and 30 gals who produced top-quality eggs. Today, we have three coops and 140 happy and healthy ladies creating a variety of fresh eggs on a weekly basis. Read more about our chicken escapades on our blog. 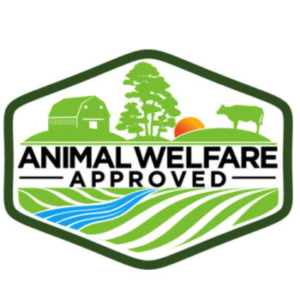 We are proud to be Animal Welfare Approved! I have to laugh when I think of the crazy research (books, internet, question and answer sessions at feed stores, spreadsheets, checklists…) that went into our chickens. I’m pretty sure my great grandparents just got a bunch of chickens, fed them, and hoped they made it. I give my gals electrolytes, heated waterers, and wipe the manure balls off their feet. Pasture-based management not only provides the highest welfare conditions for the hens, but also produces healthier eggs containing three times as much vitamin E, seven times more beta-carotene, and twice the omega-3 fatty acids as industrial eggs.